When Sari was started on tube feeding at 3 days old we hoped it would be just a temporary solution, but after failing to thrive without it, we entered the endless treadmill of feeding, pumping and appointments. Trying, and failing, to find a diagnosis was terrifying and despite seeing a whole multi-disciplinary team with regular pediatric, neurology, speech therapy and osteopath appointments there was no improvement. Plans were made for Sari to be fitted with a gastrostomy tube at 6 months of age. 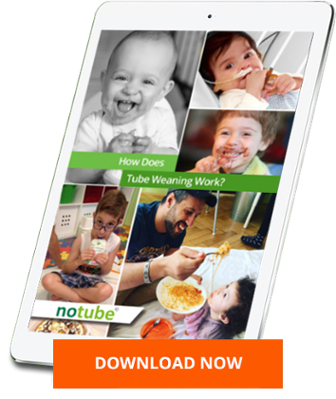 This is when I trawled the internet in desperate search for an alternative and found NoTube. I contacted Professor Marguerite Dunitz-Scheer by email. We had been following the advice to offer bottle or cup feeds before every tube feed, and realized Sari’s refusal of this was a sign she had developed oral aversion following the traumas she had experienced and had become tube dependent. I will never forget the advice from Professor Dunitz-Scheer that to accept the gastrostomy tube would be giving up. Instead we chose to begin the Netcoaching program and Sari was successfully weaned from the feeding tube in 14 days. We celebrated our anniversary of the tube wean with lots of food and huge appreciation of being able to enjoy the meal. Thank you Marguerite and your team! You are all a God send and I don’t know where we would be if I hadn’t found you over there on the other side of the world in Austria! Thank you, thank you, you are forever in our prayers! !